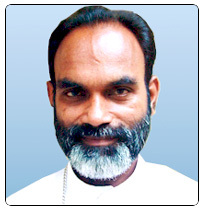 Bishop Mathew Vaniakizhakkel was born on 22 December 1945 at Vandamattam in the eparchy of Kothamangalam. After his school years in Vandamattam, Kodikulam and Thodupuzham, he joined the Minor Seminary of the Vincentian Congregation at Angamaly in 1963. After his major seminary formation at Carmelgiri and Mangalapuzha, Aluva, he was ordained priest on 18 December 1972. After M.Th. in the same seminary he was assigned the offices of the Director of St. Vincent's Balanagar, Estate Manager and Assistant Novice Master at Balasugiri, Wayanad. In 1977, he was appointed Secretary to the Bishop of Satna, Mar Abraham Mattam and later parish priest of St. Michael's Church, Kailaspur. In 1980 he was sent for Doctorate in Spiritual Theology from Angelicum, Rome. On his return he was appointed Director of the Pastoral Centre of the Diocese of Satna. In 1990 he was appointed Novice Master and in 1993 elected Provincial of the St. Thomas Vice-Province, Rewa. Upon finishing his term, he was appointed Rector of the De Paul Institute Religion and Philosophy, Bangalore. He was appointed bishop of Satna on 23 December 1999 and was ordained bishop on 12 April 2000.